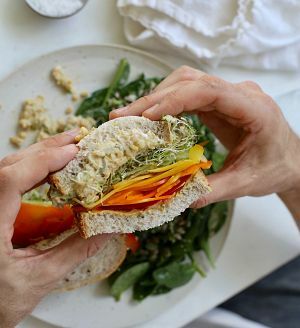 If you’ve made the switch to a vegan diet and find yourself missing tuna or egg salad sandwiches, I’d like you to meet the Chickpea Salad Sandwich. It proves that we only ever loved the tuna and egg versions for the sauce…in this case, the new Hellmann’s Vegan. It’s free of GMOs, artificial colours, flavours and cholesterol. And, it’s certified vegan! From what I remember, it tastes exactly like the original Hellmann’s. The other tangy ingredients in this recipe are of course important players, as well: garlicky pickles, strong dijon and crunchy celery. As for the sandwich’s optional toppings, I love pretty, colourful food, hence the rainbow of peppers. If you don’t have these on hand, you can definitely go with something simpler like pickles or lettuce. I also love eating the chickpea salad mixture with sprouts and hummus. But really, any fresh veg that you’ve got in the fridge can work. It’s all about the creamy chickpea salad anyways. Hope you love this sandwich! ‘Smash’ chickpeas using a food processor, a fork or a potato masher. If using the former, simply pulse the food processor a few times to reach desired chickpea consistency. You want them to be chopped, with a few whole chickpeas remaining. If using either of the latter methods, place chickpeas in a bowl and smash them with a fork or a potato masher. Add Hellmann’s Vegan, dijon mustard, celery, pickles, salt and pepper to the chickpeas and mix to combine using a spatula. For the sandwich toppings: using a mandolin, finely slice the peppers into strips. To build the sandwich, lather one side of the sandwich bread with Hellmann’s Vegan and the other side with dijon mustard. 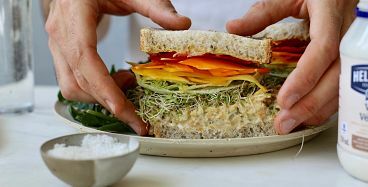 Load the sandwich with a generous portion of chickpeas salad sandwich and then pile on the peppers, sprouts and lettuce. Enjoy! Thanks to Hellmann’s Canada for sponsoring this post! All opinions are my own.